What would happen if we combined Luke Jerram’s Play Me, I’m Yours installation with Sugata Mitra’s Hole in the Wall project? By the way, in one town the students were even learning English…without a teacher. Now instead of computers, what would happen if we substituted pianos? Touring the globe since March 2008, ‘Play Me I’m Yours’ is an artwork by Luke Jerram. So anyway what would happen if we combined Luke Jerram’s ﻿Play Me, I’m Yours﻿ installation with Sugata Mitra’s ﻿Hole in the Wall﻿ project? Just asking. When I mentioned to some fellow piano teachers that I was willing to teach a few of my older students “by appointment”, rather than locking them (and me) into a weekly time slot, they were appalled. I have not changed my mind about teaching “on demand.” In fact, I see two distinct advantages. Teachers have a more flexible work week and students come to their lessons when they are ready to learn. Learning could happen everywhere through pop-up education. Much like TED Talks, pop-up education opportunities would be produced by experts, professors, and every individual based on something they know well and can train others on. They would pop up in locations like theaters, YMCAs, elevators, break rooms, restaurants, and wherever there is “wait time” or an equal opportunity for boredom, or when our technology infrastructure realizes an enhancement opportunity—like you might learn about safety while waiting at the DMV. In addition to lessons, the idea would be to provide study and learning tips to effectively train people to be better students at any age. As an adult I grab my musical inspiration and instruction on the fly. I feel privileged to have online access to excellent piano master classes by Gyorgy Sebok, Maria Joao Pires, and Stephen Hough among others. Why should we teachers be surprised to learn that our students may actually prefer to learn the same way…in short, concentrated bursts? Some may argue that it takes years to build a solid foundation of finger technique and an extensive varied repertoire. But I’ve seen students make very quick progress when they are motivated by a piece they love, a performance deadline, their friends, or a combination of all three. Besides, there’s no guarantee that the student won’t follow all of his teachers rules and advice only to be asked later by his conservatory teacher to unlearn what he’s learned and start over with Hanon #1 using some new form of wrist rotation, balance, or arm relaxation technique! What can a student learn in a pop up piano lesson? A lot. I usually spend one lesson with my high school students explaining major/minor scale construction, key signatures, and the circle of fifths. Still have time? Explain chords and inversions. Give them the basic information and today’s students will take what they need to know and apply it as they see fit. Another idea for the pop up music lesson – devote the entire time to quick and dirty tricks for basic piano technique. Or how about a lesson in sightreading? Or an impromptu performance class? Felix Glenn describes what happens at his pop up school of rock at Thomas Tallis School in London. The Stephen Petronio Dance Company pop up school at Joyce Soho in December. The Pop Up Art School at Huddersfield University in the U.K.
And for a look at pop up performance spaces read about what’s happening in Dublin. Thanks to a tweet by @pnoman, I’ve discovered another new piano flick. Pianist is a drama special set in a piano factory, starring Korean boy band SHINee‘s Minho . 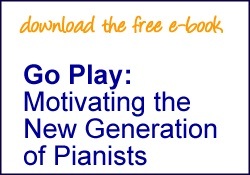 Does this ‘trend’ mean piano players are the cool kids now? A different kind of Chopin Competition. Taiwanese musician, singer, film producer, actor and director, Jay Chou…duels in his film Secret. The recent NPR article about Random Acts of Classical Music got me thinking. The performance of opera in Reading Terminal Market and the Hallelujah Chorus in Macy’s, may be random for the audience but certainly not random events for the performers. After all they all had to show up at a designated time, they were well-rehearsed, and in some cases they were in costume. These performances work because they are spectacles. And they are unexpected…for now. It’s fun for the performers to ambush the shoppers, and it’s a pleasant diversion for the audience. But it’s easy to see how the new trend of music making in market places could run amok. Imagine if you had to worry that you’d be trapped by a coloratura each time you ran into the store for a gallon of milk. Joking aside, some random performances seemingly go unnoticed. Violinist, Joshua Bell’s random performance in the L’enfant Plaza Metro Station was virtually ignored, that is until Gene Weingarten wrote this piece for the Washington Post. Here again, Mr. Bell didn’t spontaneously decide to play in the subway one morning. He was pitched the idea while he was in Washington to perform and The Library of Congress. He thought of it as a “stunt.” But let’s give the audience the benefit of the doubt. We don’t know how many of the passers-by may have wished they could stop and listen, but unlike the marketplace audiences, these people had jobs to get to. I for one don’t leave the house for work ten minutes early on the off chance I’ll run into something interesting on the way. Of course the audience enjoys these performances whether they’re taken by surprise in Whole Foods or rushing through the subway. But are these the type of performances that send kids home to practice, or convince them to apply to music school? I doubt it. In my opinion, some truly random performances happen like this…. 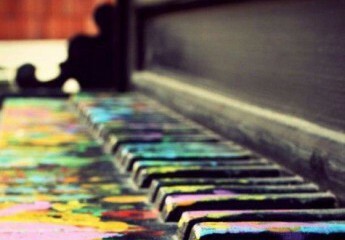 College students are allowed to play the piano in their dorm or student center whenever the mood strikes. Friends take turns playing their pieces for each other when they visit each others homes. The students in the school band or orchestra are encouraged to form chamber music groups. The practice rooms in the high school that are left open during lunch and study hall for students who want to practice. The music teacher in school sets aside the time to give his students a chance to try out the piano in the classroom. I remember exactly what moved me to ask my parents for piano lessons. There was a piano in my second grade classroom and a friend of mine was chosen by the teacher to perform. Award-winning virtuosic jazz pianist, Chris Donnelly, is on the faculty of University of Toronto and is a terrific blogger sharing his insights on teaching, performing, composing and the business of music. Recently he’s been writing a series of thought-provoking posts about the “elephant in the room” — incorporating jazz education into the traditional music lesson setting. I encourage all of my students to appreciate jazz starting out the young students with with books like these, cram them full of scales, chords and arpeggios in every shape and size, and beg them to listen, listen, listen. I’d be thrilled if after all that a student would come to me asking for a referral for a jazz piano teacher and hopeful that I’ll recognize the student who needs a push out of my door and into the jazz specialist’s teaching studio.